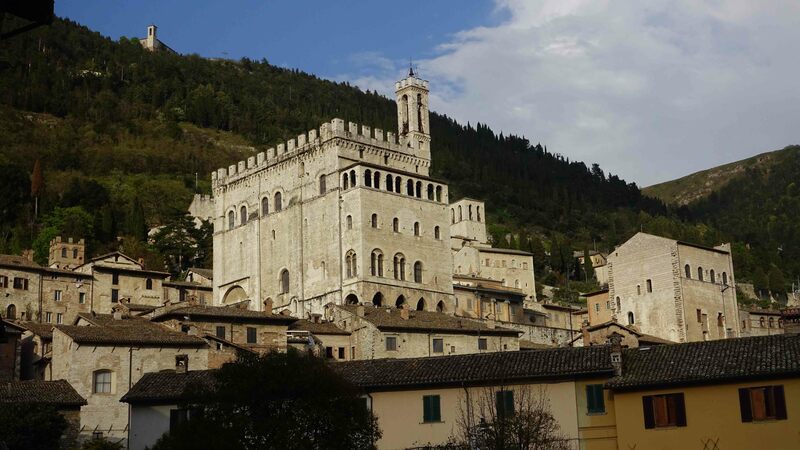 Gubbio is a beautiful historic town about two thirds of the way along our route. I’ve programmed a rest day here, because it’s such a magical place, and it has a strong connection to St. Francis. Gubbio is famous for its wolf. The story goes that a wolf began to terrorise the town, attacking the townsfolk and killing many. The wolf had gone crazy, and was hungry for human flesh. It got so that everyone was scared to venture out doors – until Francis of Assisi arrived. He tracked down the wolf, and in front of an assembled crowed began to talk to the beast. 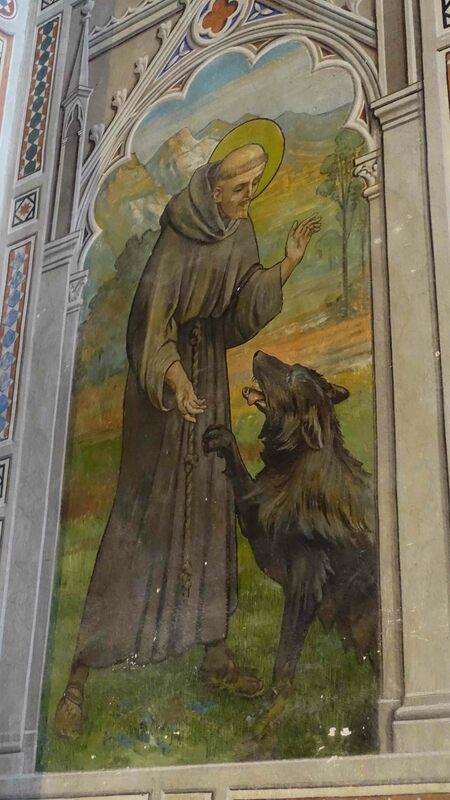 What Francis told the wolf evidently was that if it agreed to stop killing the townsfolk, then Gubbio would provide it with whatever food it required. And that’s what happened. This killer wolf became the town pet – going from household to household, getting fed. meek as a kitten. 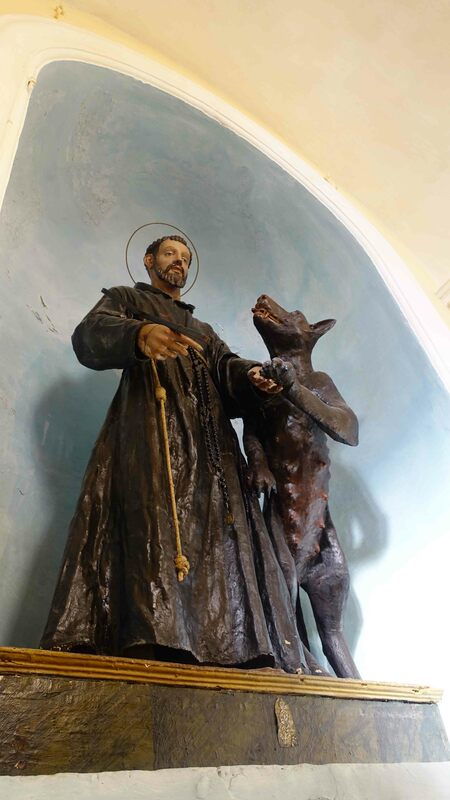 The incident with the wolf was regarded as a miracle by many – and Francis was revered even more for the way he had so bravely confronted the animal, and tamed it. 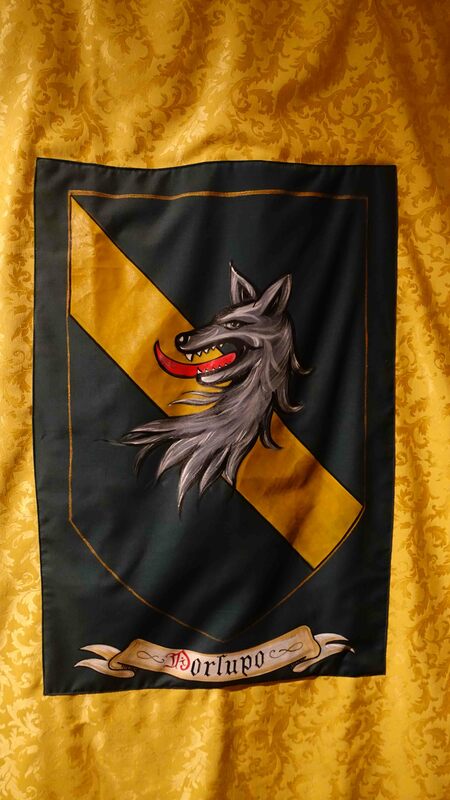 The wolf is now featured in the town’s iconography, and the bones of the wolf are buried in a church high on a hill. Jennifer climbed up there and we went into the chamber where the wolf is said to be buried, and meditated there. Later we found our way to the Cathedral, where I saw a very strange featureless angel on the floor. It looked like an eyeless mouthless moth. Kind of creepy. 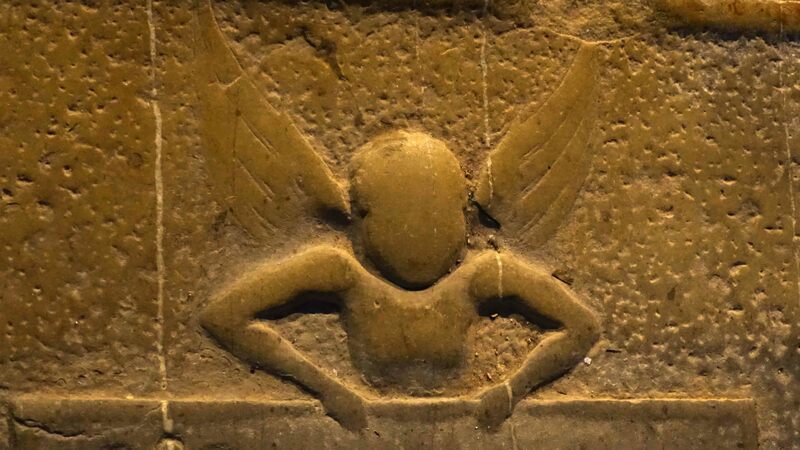 But how can angels be creepy? This one though looked like something out of a Guillermo del Toro film. Today we began to make our way back towards Florence, to meet up with the first of our group tomorrow. We stopped in a village just in time to see a small military band heralding the laying of a wreath on a military memorial. Back in Australia of course, it’s ANZAC Day, our Memorial Day. Strange to see this ceremony, so much like our ANZAC Day ceremonies, in a small Tuscan hill town. 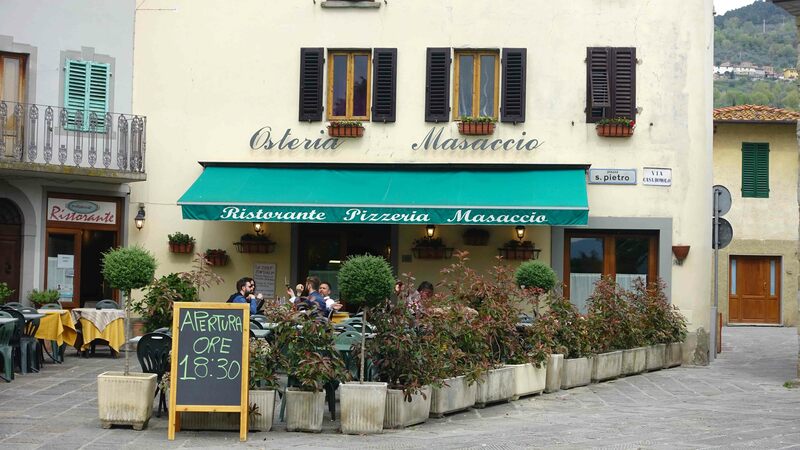 We stopped at a small restaurant about 45kms south of Florence for lunch. 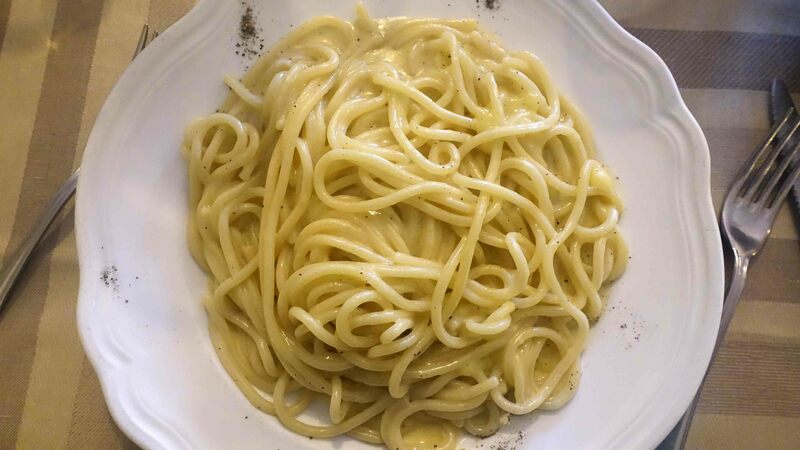 On the menu was my favourite pasta dish – Pici with garlic and pepper – a very simple dish, but delicious. 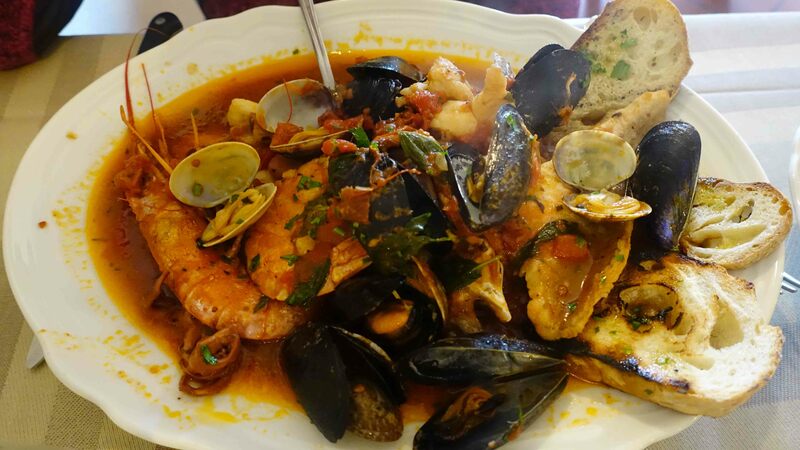 Jennifer had a robust fish stew. Will need to walk two weeks to work it all off! Can Lynda have a bite of that fish stew? Yummy, Yummy! It was more than she could eat Lynda. And yes it was very yummy! Good luck Bill and Jennifer for the commencement of your walkathon. 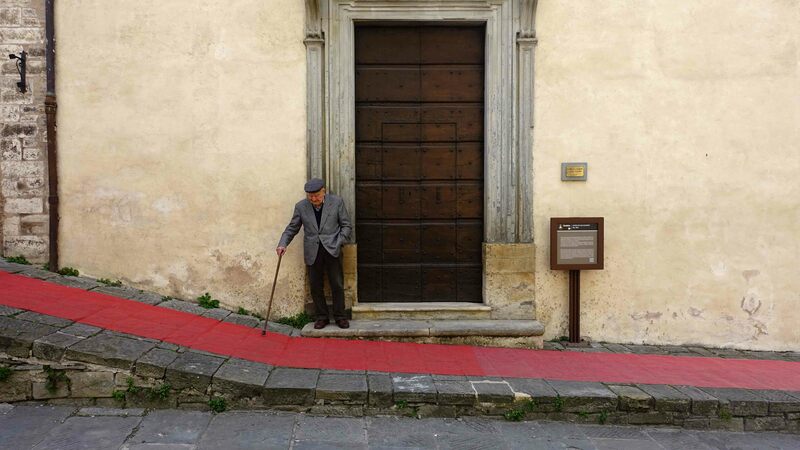 Bill….looking forward to following your Italian adventure. Might be a route my wife and I try in the future. So far, your pictures of the towns along the way have been magnificent. And not to mention the food! We are starting the Le Puy route this summer for about three weeks. Buen Camino!